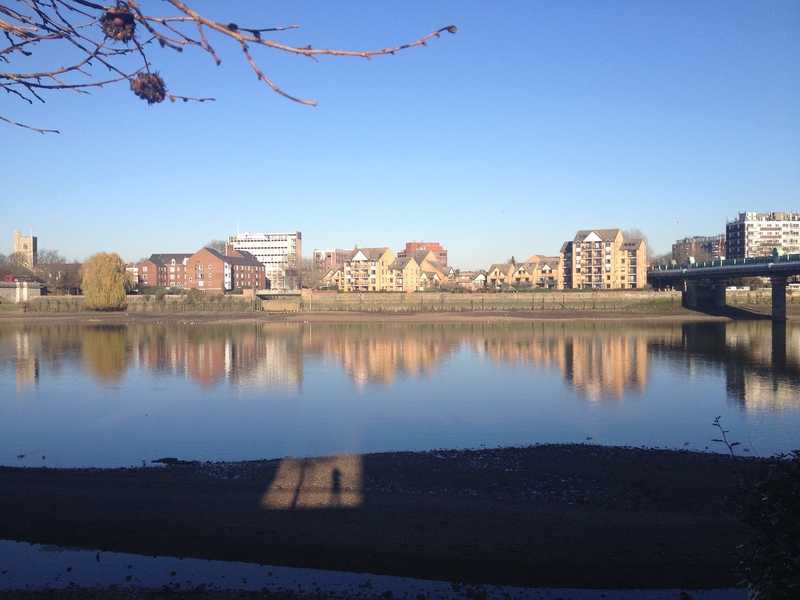 I feel so lucky to live just 10 minutes walk to river Thames in South West London. I try to go for a stroll every weekend to escape hustle and bustle of the city. 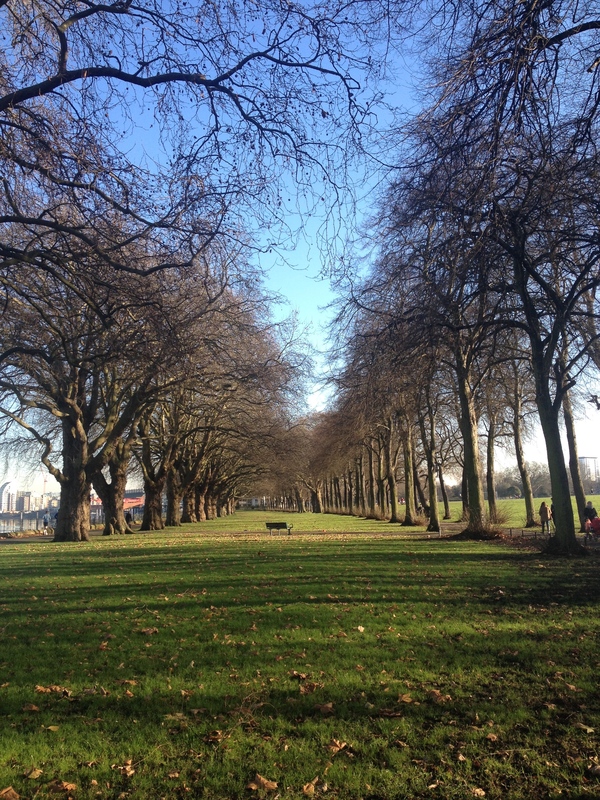 There is a path along the south of the river, usually very busy at weekends with people walking, running or cycling. Very beautiful, heading west,full of chestnut trees, elderberry bushes and lots of greenery. 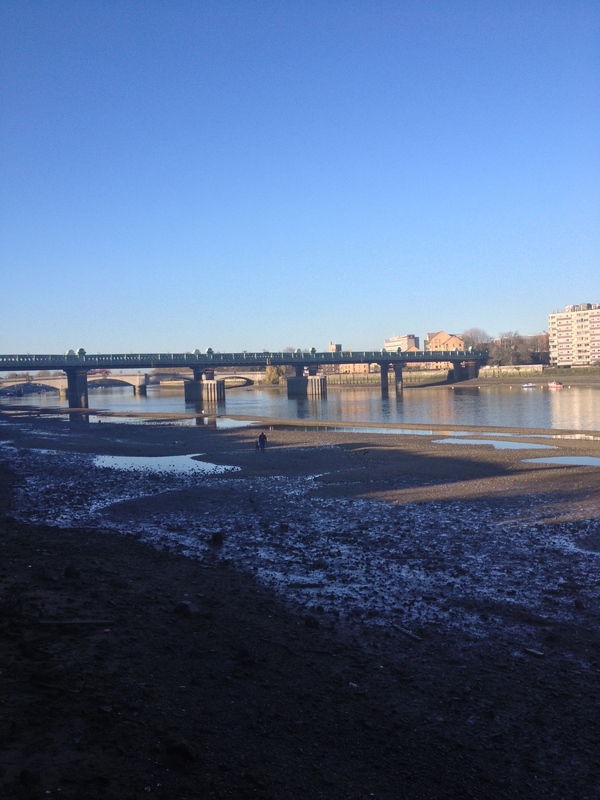 This time I cross the bridge and head north the river towards Fulham Palace and its grounds. It is quiet there, especially now when the garden and allotments are ready for winter. The ginkgo tree had bright yellow leaves last week but none left yesterday. Only beautiful tree silhouettes growing tall in the blue skies. 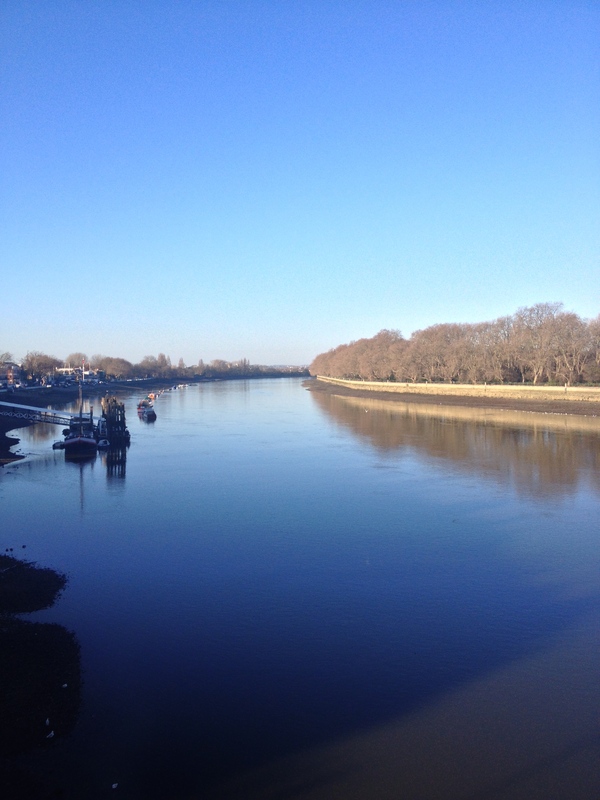 The blue skies made Thames looking blue and shiny as usually it is just grey and dark. The tide was very low and some people went down the ladder for a walk along very muddy “beach”. Crossing the bridge, I always stop and look to the west. 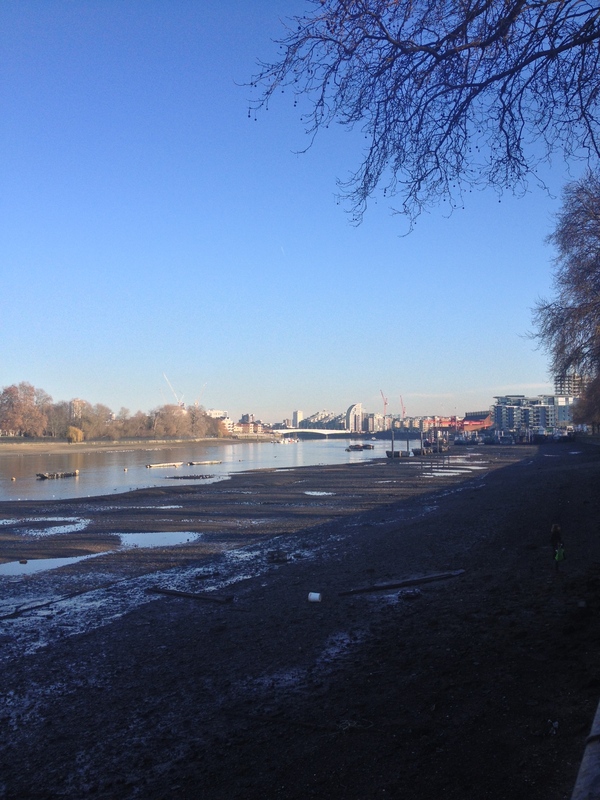 There are rowing clubs on the southern bank of Thames and park on the northern. 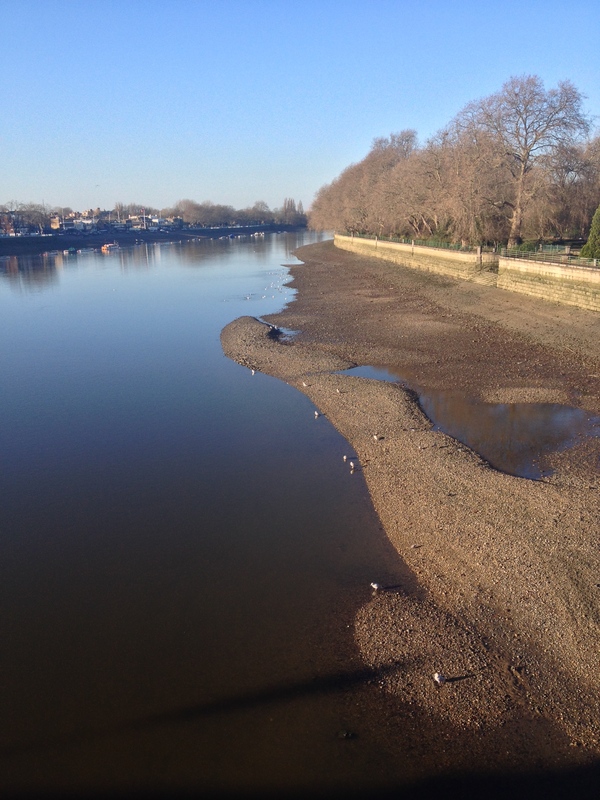 I love the vastness of the river here and how gently it turns right. Here is the peek-a-boo of the All Saints Church tower surrounded by beautiful cypresses. The church itself was featured in a movie The Omen and I really like its stonework. It was very quiet and empty at the Palace Wall garden, apart from busy squirrels scratching tree bark and eating remaining green bits. And these pretty orange berries popped out from all the greens and browns. I did a small research online and it looks like Jack-In-The-Pulpit plant and its wand of bright red berries. What an amazing name! But I might be wrong…Would have to go back there and have a closer look. I shared my post on Twitter and got a reply from @FulhamPalace saying that red berried plant is Iris foetidissima. Stinking iris. I love irises and what an unfortunate name! Or called roast-beef plant. Apparently it smells unpleasantly meaty when crushed. It has got pale yellow-purple flowers in summer and vibrant orange seed wands in winter. Would have to go back in spring to check on flowers and have a sniff too! I think it looks beautiful between browns and greens like little gems. Not only flowers, but I also love leaves, big and veiny or delicate and feathery. I found their structure fascinating. Who would have thought it is half December?